"Today, Consano gives me the possibility to showcase an aspect of my research that excites me, and hopefully to directly connect with the very people I want to help." The immune system is an incredibly fascinating organization and better understanding it has kept me going for many years. Many diseases are caused by immune disorders that we do not clearly understand. Over the years, I got to meet patients that gave a human dimension to this disease that I only knew through cells and molecules. Shortly after focusing my research on T1D, I became involved in fundraising for T1D research in general. Today, Consano gives me the possibility to showcase an aspect of my research that excites me, and hopefully to directly connect with the very people I want to help. Click here to see a cartoon describing our project. Type 1 Diabetes (T1D) not only affects 1 in 300 children by the age of 18 in the US, but its incidence is on the rise worldwide, increasing 2-5% each year. The disease may also develop more slowly and manifest itself during adulthood. In the US alone, as many as 3 million people may have T1D, and more than 30,000 new cases are diagnosed each year, half of them children. Genetic and environmental factors cause certain cells of our immune system (the T cells) to stop recognizing normal cells as normal, which is known as an autoimmune disease. The T cells think that these normal cells are actually intruders that need to be eliminated. 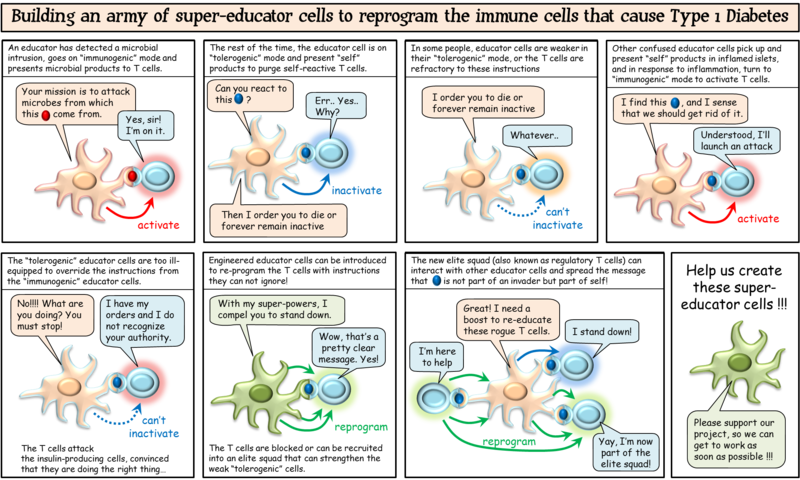 This malfunction can occur because 1) the “educator cells” are not properly programming certain self-reactive T cells to be eliminated or remain unresponsive and/or 2) the T cells are no longer following the instructions of the “educator cells”. T1D is one of the most commonly known of these autoimmune diseases, in which T cells mistakenly attack insulin-producing cells (islet beta cells) in the pancreas. When these islet beta cells can’t produce enough insulin, blood sugars rise to dangerously high levels unless controlled with supplemental insulin. It is becoming clear that to achieve a durable remission of T1D, there needs to be a reprogramming of specific T cells. Our objective is to engineer educator cells (generated from particular blood cells) to deliver a more complex set of instructions that will override the T cell malfunction. These new signals will: 1) teach the T cells that the islet cells are normal and should not be attacked, and 2) convert these same T cells into helpful “regulatory” T cells that reinforce the function of failing educator cells and counteract T cells that escaped reprogramming. This approach has multiple advantages over the use of conventional drugs by reprogramming only the relevant T cells and leaving the other T cells free to react against real intruders. Instead of using a conventional drug to treat symptoms of the underlying disease, our approach aims to use the body’s own immune system to correct the underlying malfunction which causes the disease. This represents an important step toward enhancing the efficacy of cell-based immunotherapy, a new form of personalized medicine with remarkable potential. We will engineer our educator cells to deliver specific signals, and we will measure how T cells respond to these signals. Not only can we see if T cells from a T1D patient ignore a particular signal (a signal that would not be ignored by T cells from a healthy individual), but we can also test combinations of signals that will make the T cells better understand the instructions they receive. Ultimately, these engineered educator cells will be used to reprogram malfunctioning T cells so that they stop attacking insulin-producing cells. Therapy with engineered educator cells will be used to prevent T1D in high-risk individuals. This therapy may also help recently diagnosed T1D patients by stopping the autoimmune attack. The lab seeks to create educator cells from dendritic cells or stromal cells. Check out the first paper from the lab, recently published in the journal Molecular Therapy Methods and Clinical Development (open access).